This is Belonging…Grace in action. Blessings to each of you, inclusion friends. 2017 was a very busy year for The National Catholic Board on Full Inclusion. We collaborated with Dioceses, non-profits, Catholic families, learning support teachers, educators of all stripes and inclusion advocates all over the country. There is an effort at the beginning of a New Year, to choose a word that will inspire, encourage and sustain you all year long…some teachers do this as a class, some writers do this…some individuals do this. Belonging first came on our radar after Dr. Erik Carter spoke to us during our first ever Inclusive High School Conference. During his keynote speech, he pushed us…nudged us…asked us to move past inclusion, to belonging. He made the comment that we should pursue people with disabilities to be part of our schools because we ache for their presence. He asked us to “offer an extravagant welcome”. After Dr. Carter’s keynote, the word Belonging kept rumbling through my head, popping up in unexpected ways…reminding me that we should ache for the people who are missing; the ones left behind in the margins, wishing for a way in. Belonging asks us to consider inclusion in a deeper, more elevated way. It feels more like what we are called to do as faithful Catholics, much more than the sanitized, utilitarian word of inclusion. It is when you feel down to your core that your presence is enough…no worthiness is needed…no hurdles to jump. Belonging feels more faithful…more loving…more compassionate. It’s true, I’m impatient…I’m ready right.this.minute for every Catholic school in America to be wildly, unabashedly, fearlessly inclusive…but maybe my heart is asking for even more than that…maybe my soul is craving belonging. Knowing even one person is on the outside looking in, is too much. We are called to be universal in our faith. Called to sit with the discomfort, the unknown, the never-been-done- before difficulty and still SAY YES. Seeing this picture up top is where we are headed. This picture is a reminder of what it feels like to be radically welcomed. Our goal is to build the bridges…walk the path…guide the way so that others can feel their heart rest in the comfort of true belonging. For when we have belonging, we have Christ. So, 2018, here’s to creating space for Belonging…elevating those that are included to an even deeper sense of connection. 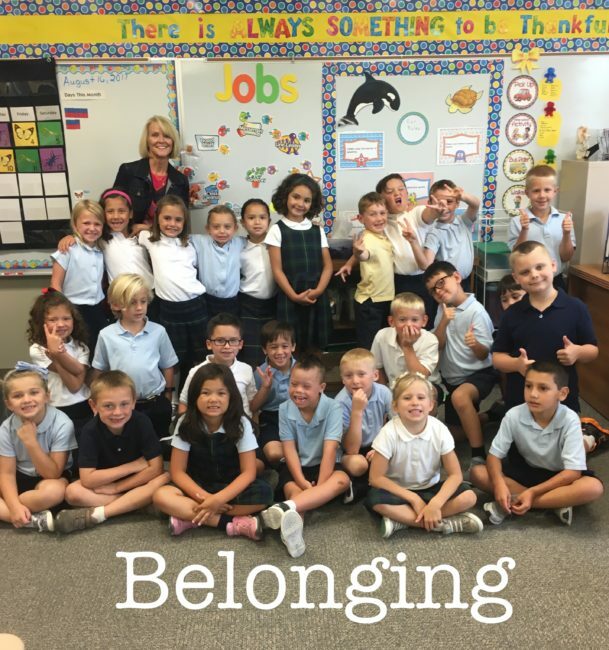 Together, we can build these havens of welcome….it’s up to each one of us…let 2018 be the beginning of belonging in our Catholic schools.